Most gas stations had repair garages but not all repair garages were connected with a gas station. 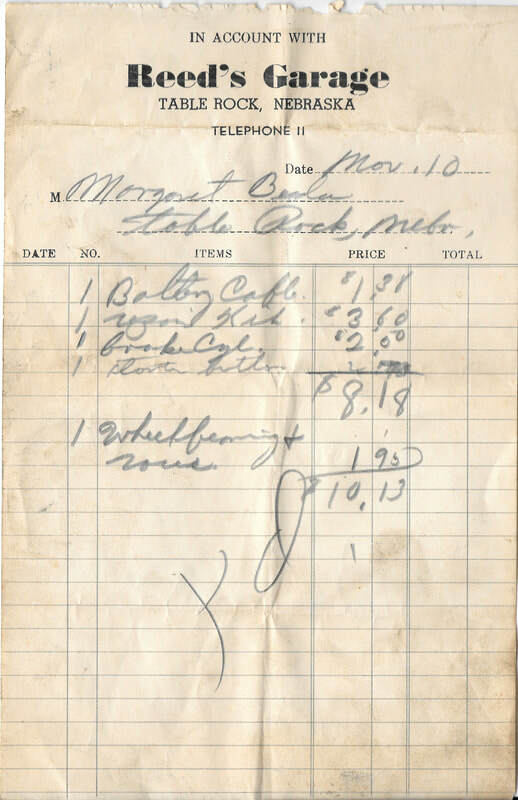 And in earliest days, some repair garages had gasoline tanks even though auto repair was their main business. 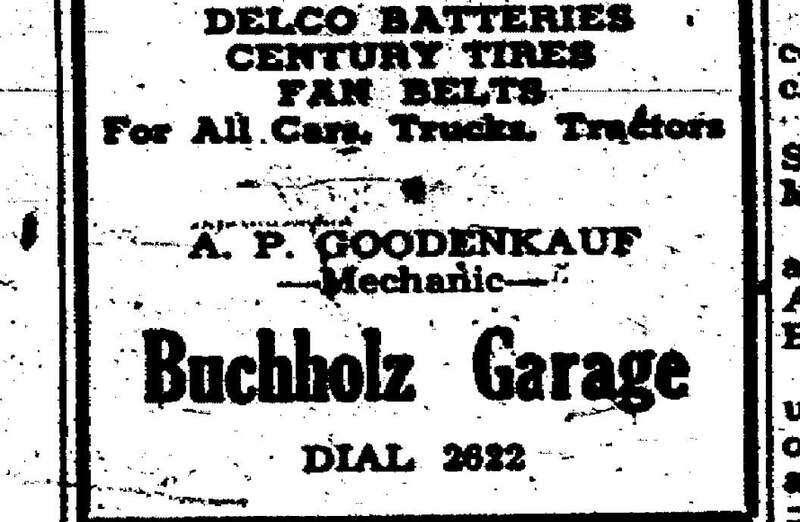 Wilbur Buchholz ran this repair shop, with the aid of mechanic Alfred P. Goodenkauf, whose whom was just south of the shop. It is on the north end of Houston Street. 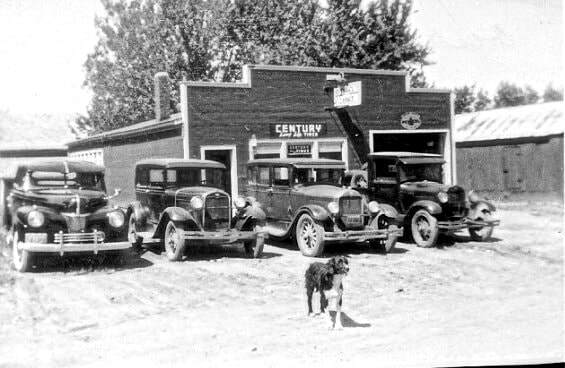 Wilbur Buchholz's garage, with cars and Rick the dog in front. Photo 4069, shared by Valerie Binder. Photo 4067, proprietor Wilbur Buchholz, shared by his granddaughter Valerie Binder. Photo 4068, the garage in 1949, shared by Valerie Binder. 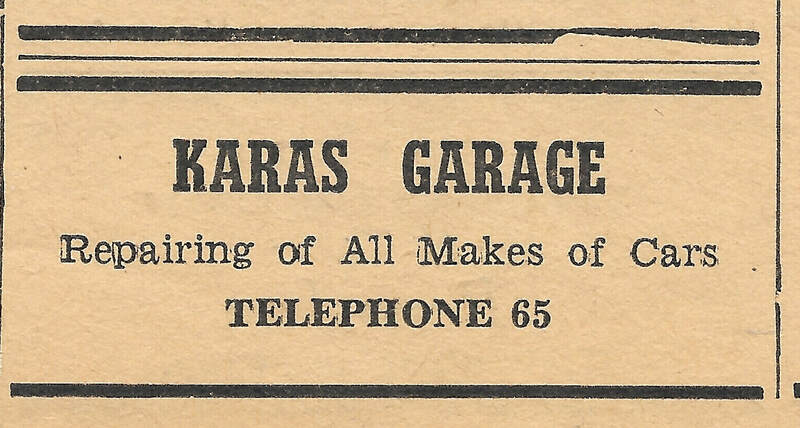 This ad from the July 3, 1925 edition of the Argus touts the Karas & Hubka garage. 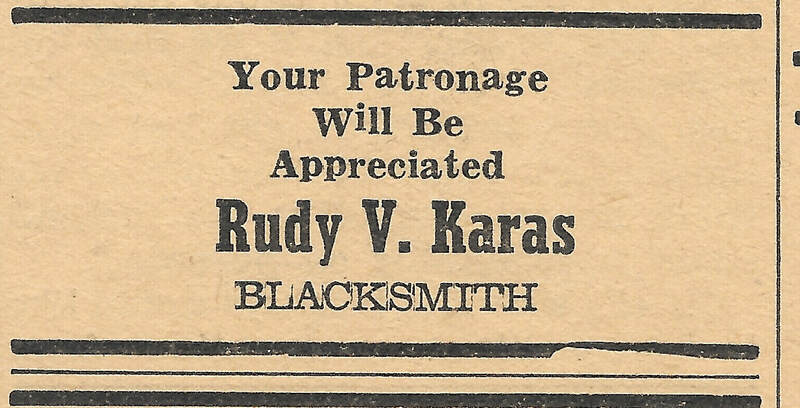 The Karas was likely Rudy V. Karas before he had his big Ford garage on Luzerne. 1927. 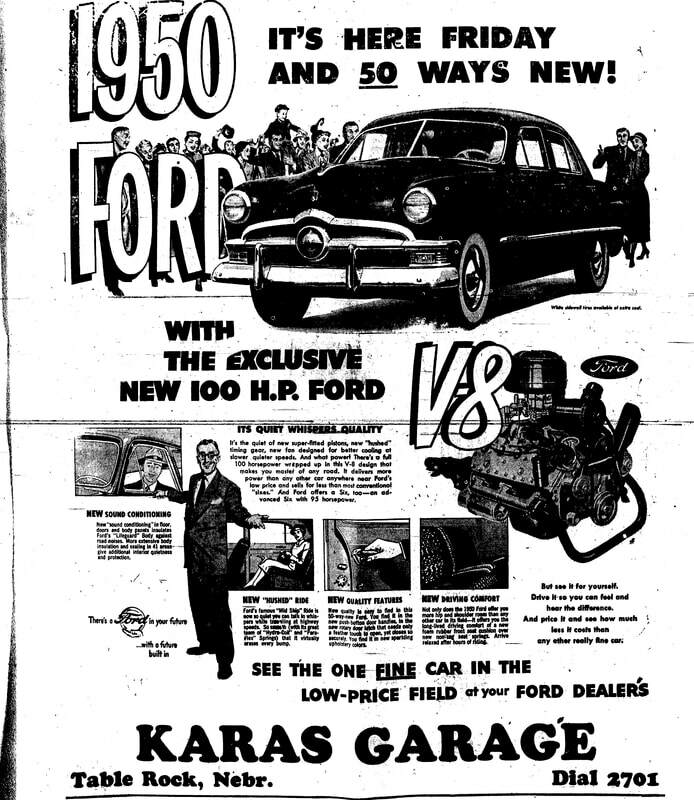 Rudy Karas bought his big Ford garage on Luzerne a few years later. 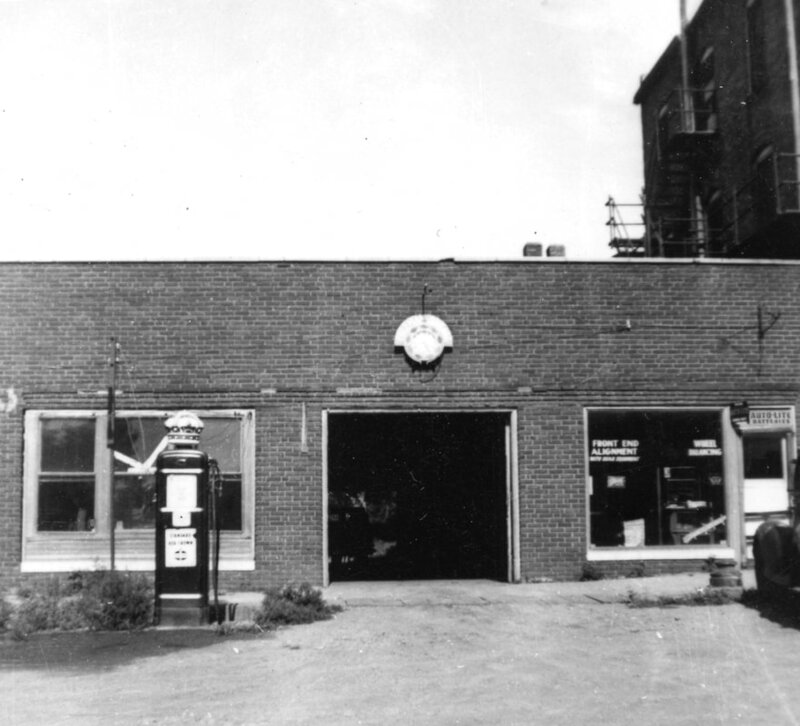 ownership at the time unknown - this is the garage where karas was located at some time. it was built in 1917-8. it is gone now. Photo 4943, an undated photo in an album compiled by Ines Madden. Most of the dated pictures in the album are from the early 1950s. The building was constructed as a livery stable around 1900. On the second floor in the back part of the building was a "hall," a huge room used for dances, meetings, and so on, believed to be theone sometimes referred to as Nemecek Hall. 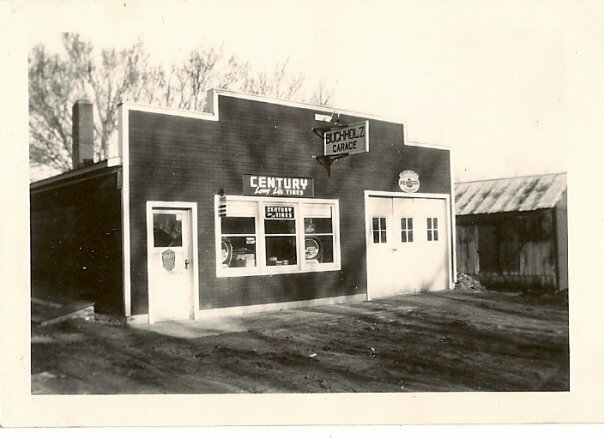 It was the Brace auto repair garage in the late 1920s. 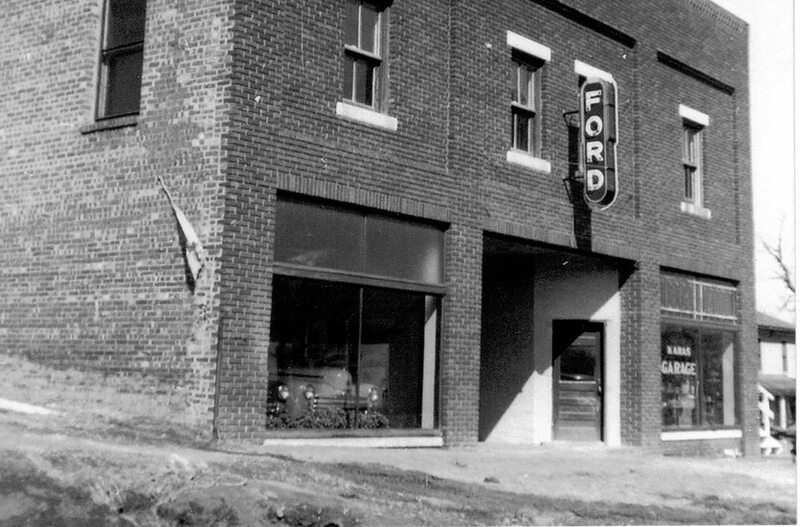 After a big fire in 1930 or 1931, which took off the second floor of the back part of the building, it was bought by Rudy V. Karas the Ford man (as opposed to Rudy V. Karas the blacksmith, jokingly called "Dirty" Rudy because of how black his hands were burned over the years). Karas ran the garage for many years. After his death, it sat empty until the Sitzman Brothers were able to buy it. In the 1940s or so. Photo 4030, shared by Judy Aylor. From a 1943 issue of the school paper, the Echo. 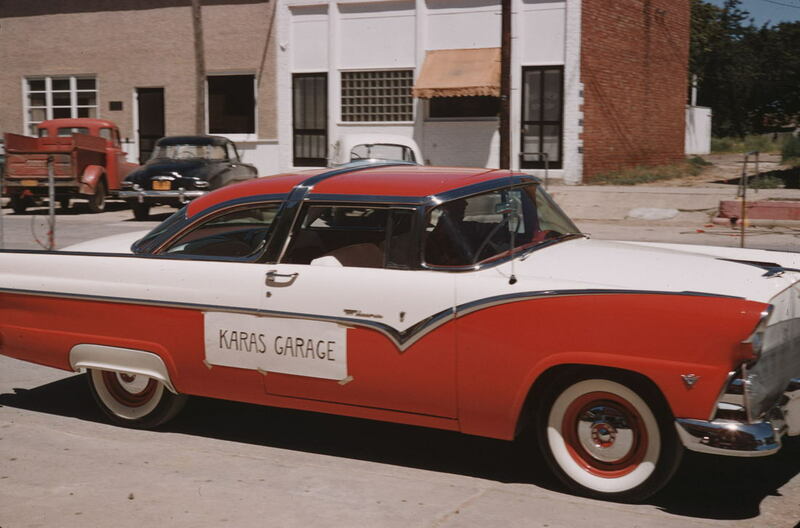 Photo 1070, 1955 parade entry by Karas Garage, taken and shared by Edward Tomek. Sitzman Repair, on Luzerne, east of the Square, was started in the 1980s by brothers Larry, Robert, and Richard Sitzman. Richard has been sole proprietor for many years now and as of 2018 it is a bustling place. There was a prior Sitzman Repair on Highway 4, run by Richard's dad Bob Sitzman in the 1960s. The building occupied by the present Sitzman Repair has been used by two previous businesses. The Karas Garage previously occupied the premises and before that it was the Brace Garage. The Lincoln Hotel complex was built in 1918 with four components -- hotel, theater, retail space with an apartment over it, and, on the south side of the hotel, a garage. The garage was used by various people, and in its last years held a laundromat. Photo 4943, garage on the south side of the hotel. An enlarged copy is above on this page. ​Here's what I remember about the building that was turned into a laundromat. When I was growing up there was an over the road trucker named Reed living in Table Rock somewhere west of the lumberyard. 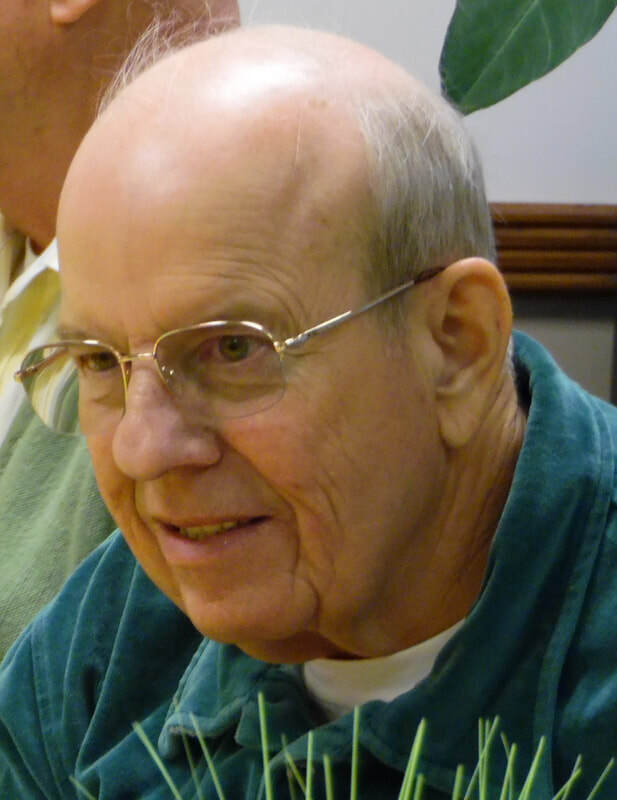 Mr. Reed had a son named Vernon who he hoped would take over his trucking business. It turns out Vernon was allergic to some of the material hauled in his dad's truck so his dad built an automobile repair garage south of the hotel. Vernon didn't last long as a mechanic so he sold the garage to Glen Freeman who had a son named Robert [and a daughter Verna]. Glen had a well-stocked garage and was a good mechanic. 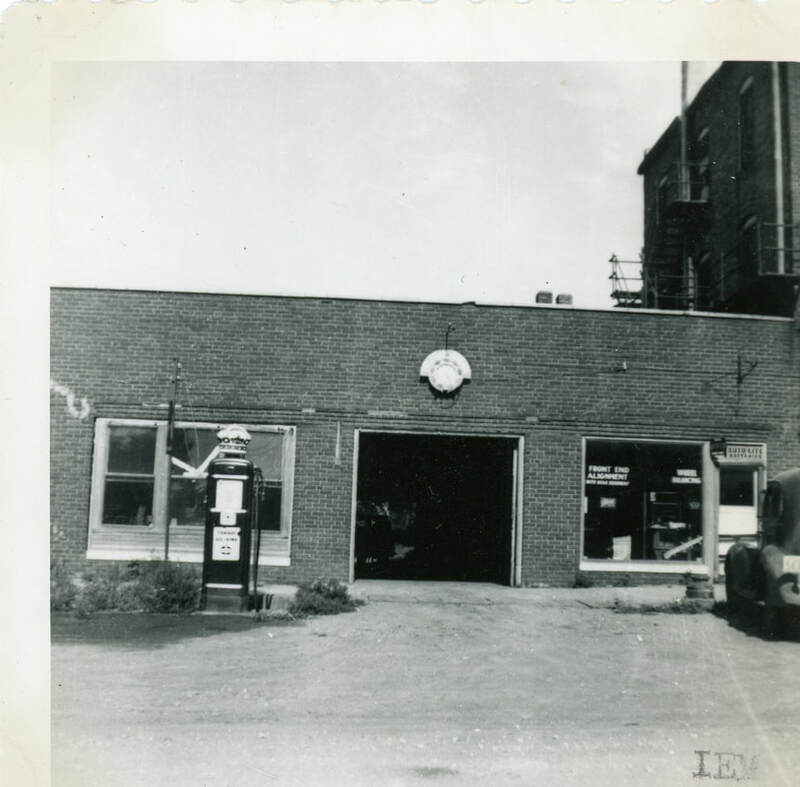 He had a tire alignment machine made by "BEAR" in the southeast part of the garage and an office and small parts inventory area in the northeast area where the drive-in door was located. He worked on cars in the west side of the garage. 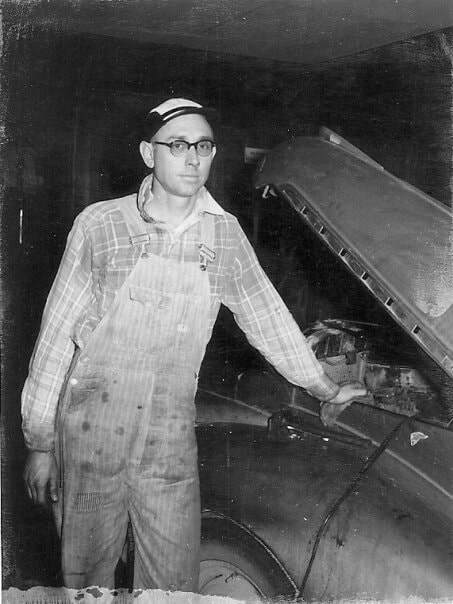 I remember he worked on my 1948 Chevrolet coupe and several of my dad's cars.